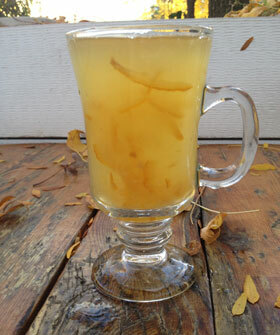 The Yuzu Toddy will warm your belly during the holiday season. Find out why Derek Alexander, a successful bartender, looked to the colonial era to formulate his recipe. Discover other holiday cocktails in our collection of original recipes from the top bartenders across the nation. Add water and yuzu rind and bring to a simmer. Mix 100 grams of sugar and pectin. Add to water and rind. Add the honey, the remaining sugar and glucose. Heat until NAPÉ consistency. To test, coat the back of a spoon and make a trail across with your finger. The line should hold its shape. Add citric acid with equal parts water. Cook for 30 seconds to evaporate excess water and chill. To assemble the drink, mix the yuzu honey, Maker's Mark, Lairds Applejack bonded, yuzu juice and hot water. For whiskey, Derek Alexander (the bartender who created this cocktail) suggests Maker's Mark. For apple brandy, he prefers Lairds Applejack bonded.